There are more variations of broccoli salad than almost any other salad. I like the sweet-tangy dressing on this one but often change the ingredients, other than the broccoli of course or it wouldn't be broccoli salad. You can skip the blanching step but I like the bright color it gives the broccoli and I think it tastes better too. I prefer using red grapes instead of raisins, but raisins are a good pantry item so I use them if I don't have fresh fruit. Chopped apples are a good addition. The bacon is optional for many people, but not for me. I usually serve it in a small dish to be passed around for those who indulge. 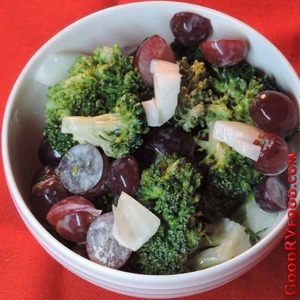 This salad travels well in the RV and is very refreshing to serve at snack time or meal time. I like to make this in the morning before we get on the road so it is ready whenever we stop or need something cool and fresh. Cut broccoli into bite size florets. Blanch in boiling water just until color turns bright green then cool quickly in ice water. 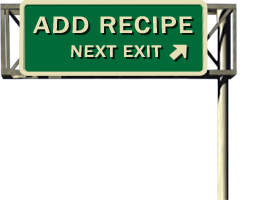 Mix mayonnaise, sugar, and vinegar together adding salt and ground pepper to your taste. Add the dressing to the salad and refrigerate covered for one to two hours before serving. Top with crumbled bacon right before serving so it stays crispy and crunchy.